Dooley's City Centre Hotel, Waterford is a family run hotel in the heart of the Sunny South East. 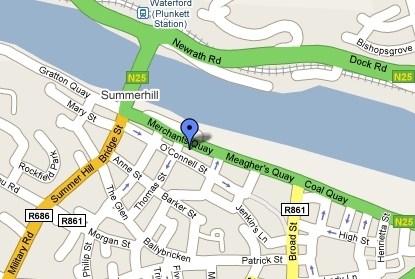 Dooley's Hotel is just a few minutes walk from the main shopping, business cultural centres in Waterford. Guest Rooms: Dooley's Hotel, Waterford strives to offer you the best in accommodation at competitive hotel prices without taking from your experience and comfort. Location: The shopping, sightseeing and business districts are a stone’s throw from our Waterford City Centre Hotel which boasts views of the River Suir. The hotel is across the road from Waterford Bus Station, 5 minutes walk to the train station and less than 10km to Waterford Airport. Waterford City is connected to Dublin City and Airport via to M9 motorway and is less than a 2 hour drive. Restaurants: Our Dry Dock Bar is open all year round for breakfast, lunch and dinner. Weekend entertainment is offered to you on Friday and Saturday Nights, with a traditional music session on Wednesday nights during the summer season. Our New Ship Restaurant @ Dooley's Hotel caters for all occasions. It brings a blend of IrishEuropean food to the table. An extensive wine menu is available to compliment our menu's.